I’ll be real with you: I’m writing this while fighting a sinus infection — my eyes bloodshot; my face puffy; my grip on reality only tenuous—and heavily aided by copious amounts of Lemsip and a hot flannel to my temples I haven’t removed since Monday. Our boy Mauro Ranallo is also unwell, and was sent home from this taping with the flu. His replacement is Michael Cole, which is a sobering thought. If I called in sick to this column, (or if someone one day made an executive decision to wrestle it from my trembling, rheumatic fingers), who is the Voices of Wrestling staff equivalent of Michael Cole who would fill my boots? Does it even bear thinking about? On weeks like this, when I’ve been too sick to get out of bed, and RAW felt like a very distant priority in comparison to standing upright without falling over, or being able to take a full breath of air without choking on my own phlegm, I have to depend on the unreliable protagonist of the SmackDown RAW recap. More and more these video packages look like they’ve been assembled by angsty tumblr teens (with all due respect to this demographic, who I adore) with choppy editing skills and too many graphical filters at their disposal to really decide what they’re doing. From what I can surmise, under dramatic music and weird colour gradients, RAW featured a transparently hastily fumbled-together title change and subsequent feud booking for Kevin Owens. Presumably it would have foreshadowed Ambrose’s superfluousness in the triple threat at Fastlane too heavily if he already had a belt around his waist. The other contenders in the fiveway were baffling choices, with barely even the whisper of claim to any sort of title. Still, while I understand that Breeze’s fatal flaws of being short (read: taller than average, actually) and Canadian (like Kevin Owens?) prevent him from being anything else than a revolving door for receiving clotheslines, a wistful part of me muses upon an alternate timeline where we came home to Fastlane with IC Champ Tyler Breeze. He could have pinned Stardust, no one cares about Stardust. Imagine how beautiful Breezey would look with the Intercontinental in tow. He could line it with fur fabric. Show-off Dragons or Lucha Show-offs? I don’t have any conviction in my opinions this week. Kevin Owens is on commentary, which is always a gift, because he’s one of the few people who make any sense or attempt to tie any plot points together. “I’ve beaten Ziggler a lot of times,” he grumps, with regard to his upcoming title defence at Fastlane—and it’s true. Owens has something of an affected version of his PWG commentary self on here—demanding replays of Sin Cara being thrown into the barricade, and then chuckling heartily when his wish is granted. Sadly, Michael Cole is no Excalibur, and shuts down his endearingly human distractions with over-rehearsed lines advertising the upcoming PPV. This match has a hot urgency to it from the get-go, which is exactly the sort of refreshing contrast that we need, to RAW’s endless droning expository promo openings. Anecdotally, I’m gradually seeing critical reception to SmackDown becoming warmer, in this USA Network era—even enthusiastic in some instances. 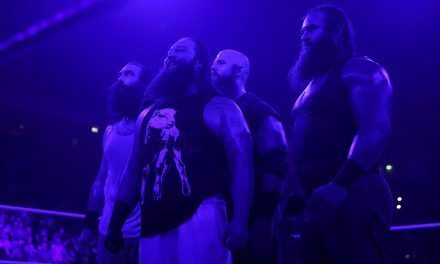 There has been more focus on wrestling, and even struggling through a split-roster show last week doesn’t seem to have alienated people to the extent it would have before Christmas. The League of Nations look magnificent here—like real heavy-hitting brawlers, credible monsters. Throwing powerbombs on Kalisto makes them look a lot better than losing a handicap match against Roman Reigns—who knew? Sin Cara, being the only member of the Show-off Dragons without a championship match on Sunday, eats a lot of offence: getting trapped in headlocks and thrown around floppily into Sheamus’s backbreaker over and over. When Ziggler gets a late-game hot tag, he’s like a slinky falling down the stairs; a flash of coiled metal; exponentially unhalting momentum. He has several close-call pinfall attempts, and nearly has Sheamus down for three, until Owens leaps on the apron to look at him distractingly, which allows for the Sneak Brogue. This match is introduced with a video (in a fake Facebook interface border, which is one of my greatest irrational pet hates) featuring Naomi giving Becky some hassle in the car park; making passive-aggressive digs; then just kicking her straight in the face, into a car bonnet. It feels like now Becky Lynch’s character is solely “sad girl to feel sorry for”. You can go too far with an underdog story. Being reunited with the charisma factory that is Sasha Banks can only be a good thing for Lynch—team Best At Everything was a silly acronym, but I feel like Becky needs that kind of self-esteem boost now. A match heavily aided by forgiving edits, there are a few mis-steps here but the fight does a competent job of displaying Tamina as strong and Sasha as smart. Banks is a tiny, furious, fuchsia ferret here, all bared teeth and whirling elbows—as Tamina tries to toss her aside. A clumsy set-up to the Bank Statement finishes the match, although the bell rings before Tamina actually starts tapping. Naomi attacks Sasha from behind after the match; straddling her with lime paisley athletic leggings, flailing fists into her face. Lynch makes the save, but Banks resents the implication, and shrugs off her help. Lynch practices her hurt, rejected face once again. Turns out that the Codebreaker finish to Jericho and Styles’ match last week was a mistake, and the match was REALLY ought to end by Styles flopping on to the ropes and falling over. I’m no kind of wrestling insider, but do you think that’s how the road agent posited this match to the men? “Okay, so at the end, Styles, you’ll trip and look like an idiot, fall flat on your face, and get rolled up. Good?” Instead, Jericho forgot how wrestling rings work, or how his legs work, or both, and the Codebreaker was a mangled attempt at getting the required result. All this has devolved into more weird flirtatious nonsense between 38-year old indie rookie AJ Styles and 45-year old grizzled veteran dad Chris Jericho, where they can’t talk to each other properly without playing hard to get, and the Miz is inserting himself weirdly between them like an unwanted younger brother in a romcom. Jericho is about to bless us with his response to Styles’ proposal for a rematch, until the Miz decides he wants to wrestle Jericho instead. So…. There’s been more time devoted to actual wrestling matches on SmackDown lately, but sometimes it feels like the wrestlers haven’t got the memo, so they’re trying to stretch out three minutes worth of wrestling into a ten minute match. It also seems unwise to spend a relatively long amount of time on a match which is just time-killing before the crowd get what they want: a “We want AJ” chant swells and rises to a crescendo as Jericho desperately throws flying crossbodies to try and win attention. There’s half a foot of fresh air between most of the strikes in this match, which give it the impression of an unconvincing montage from a low-budget action movie, but it still has bursts of excitement—like a missed Lionsault that looks agonising. Both men look haggard and defeated by eight minutes in: faces dripping, matching angry red torsos. Jericho gets the win with the Walls of Jericho. Styles politely waits til after the bell to interrupt, sporting a baggy leather waistcoat over a hoodie (#worstdressed). …so utters Jericho, without a hint of irony, knowing full well that until ten minutes previous his last match had featured him wildly messing up a finish in a main event, because, well, who put those pesky ropes there? Chris seems absolutely determined to channel the drama of the Undertaker refusing Shawn Michaels’ Wrestlemania rematch, placing onerous emphasis on the words: “my answer…is no.” No one has given Styles a microphone (wisely), so he responds in a universal language: with a flurry of spinning backfists and a clothesline over the top rope. This changes Jericho’s mind, for some reason. Oh no, Ric Flair is here, lurking in the shadows of his unfeasibly tall, hot pink bedazzled daughter, and it makes my stomach lurch in a uniquely unusual way that I don’t think is entirely to do with the fever I’m in the midst of. “Come on baby!” he grunts at intervals throughout this match. Cole decides that this match is an excellent time to talk about Daniel Bryan and Brie Bella, because presumably this is noted down on the timetabling sheet as “blank space to plug whatever”. I feel like I’m repeating myself every time Natalya wrestles on SmackDown, but it’s really the same old situation: her one sequence of technical takedowns, that she performs with a dazzling smile. There are ingredients here of a wrestling match, but it’s like Natalya’s on a catwalk, and I’m fascinated by the way she keeps flourishing and grinning after taking chops and being wrenched into submissions. I can’t even maintain a smile for any period of time when I’m in a neutral mood. I walk down the street living my life and construction workers yell “sweetheart, who’s died?” No one shouts that at Natalya. Perhaps her whole wrestling persona is just elaborately designed to prevent cat-calling. Thus, the patriarchy has won. Natalya does look good: her discus clothesline into a German suplex is really intensely enjoyable, but nothing matters at all because Charlotte locks in the Figure Eight when she decides it’s time for the match to end, and that’s that. Brie runs out after the bell to throw “Daniel Bryan’s kicks”, and do some Yes! chants, because heaven forbid a woman have a character that isn’t defined by the man she’s associated with. It’s no surprise that this match is even less about the match than usual—and SmackDown main events are rarely ever about the match. Bubba Ray gets up close in Roman’s face with some unnecessarily racial trash talk to bait him in the ring. Bubba Ray is angry a lot, isn’t he? Even when he was a good guy he seemed angry. The Shield boys go for dual-clotheslines across the ring, crossing paths with poetic symmetry—except Bubba tumbles neatly out of the ring, and D-Von gets stuck on the ropes and dangles there, until the forgiving camera takes pity on all of our awkwardness. “This Dean Ambrose is a whack-job, isn’t he?” mutters Cole. Meanwhile, worldwide, mentally ill people struggle to find work and safe housing because of social stigma. “A slurpee full of crazy!” guffaws Saxton, as over 46 million Americans live with the challenges of mental illness every day. This match is a collection of plunging stunts of increasing violence, but just as Roman’s about to start his locked-in-animation of swooping Superman punches, Brock’s music hits. 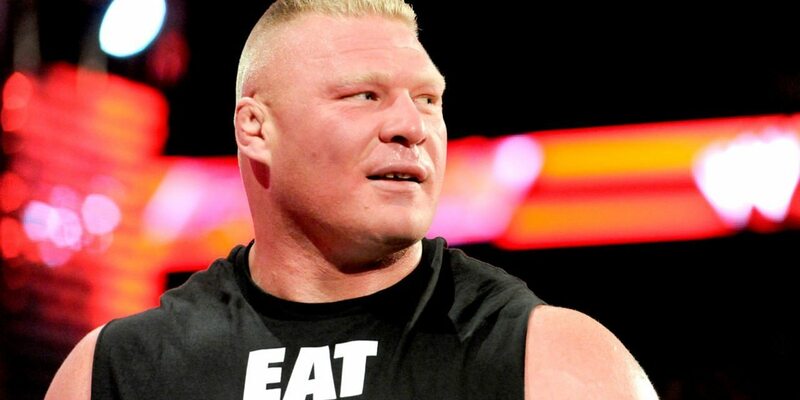 “Tonight, after 12 years, Brock Lesnar returns to SmackDown!” grunted the vignettes throughout the night. Brock Lesnar was heavily advertised for this show, and yet his only role is a presumably impromptu run-in during the main event? I’m imagining him sitting backstage, twiddling his thumbs as the show goes on, wondering “Surely I have a match soon? Or a chance for a promo? I was advertised!” and then eventually realising they had forgotten to book him for anything, and having to run in to interfere to make sure SmackDown viewers got their money’s worth. Or perhaps he just told executives ahead of time—“I’ll be sat backstage at SmackDown this week in case I see anything I’m offended by. I’m dragging myself out of my cosy bed in my snow-covered shack in the woods of a Thursday.” (That’s how Brock speaks. He says “of a Thursday”. I’ve never been any good at impressions) He continues: “…Then I’ll be ready to get in there and throw F5s. Don’t worry , there’ll be something to earn my ire.” In this way, Brock Lesnar is a lot of like the userbase of Twitter. Brock’s bunny-hop bouncing on the ramp is enough of a distraction to leave Ambrose and Reigns stunned and vulnerable to a 3D. Lesnar gets involved, flush with the spirit of low-blow vengeance, throwing Ambrose into the barricade with one fist, assaulting Reigns with the other. There’s a brief moment that Cole describes as “double teaming the beast!” where Reigns throws that pent-up punch and looks like he might be gaining an advantage, but Ambrose… poor, feckless, hurt, rejected Ambrose—he can’t help himself. Dean goes for the Dirty Deeds on Reigns. “Do it to them before they do it to me” could be Dean’s catchphrase at this point. You could only stretch his trust so far. This scuffle allows Brock to get in some more suplexes and two F5s. In the last sixty seconds of SmackDown, Triple H emerges, clutching his belt against a freshly laundered suit, to smugly stare down Lesnar from the ramp. I was too ill to contribute to the Voices of Wrestling Fastlane preview, having to maintain my lifeforce and channel it into this review instead, but my only real wish for the championship match is that if somehow, through some fluke accident, or rogue fist to the crotch, Dean wins the gold—please let him be reincarnated in his NXT black trunks and kneepads. Free him from his denim prison. It’s what’s best for business. Final Thoughts: Some working boots on this week, but a bizarre way to feature the much-hyped Brock Lesnar in the go-home SmackDown for Fastlane. NextWWE Fastlane, New Beginning, Honor Rising & more! Intrepid SmackDown reviewer. Seasonally-themed gimmick match enthusiast. I mark out for hugs and fireworks.